*This photo has not been doctored. 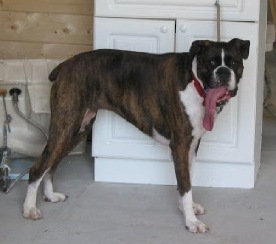 Boxers are known for their looooong tongues! Hmmm...sangria. Was there lots of fruity bits? That's my favorite! i wanted to go off on rocky and how neglected he is but fear, it's a small world, someone could find the pic and recognize him and lash out at me....so i refrained (would have emailed you but don't seen an email). it was so depressing. and my brother says even when they're home they leave him outside all day and all night. i wish i could have said something, but how do you do that?